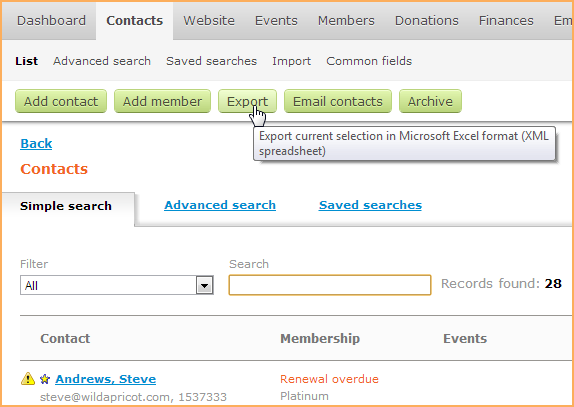 You can export your contact and membership data from your Wild Apricot account to a spreadsheet file. 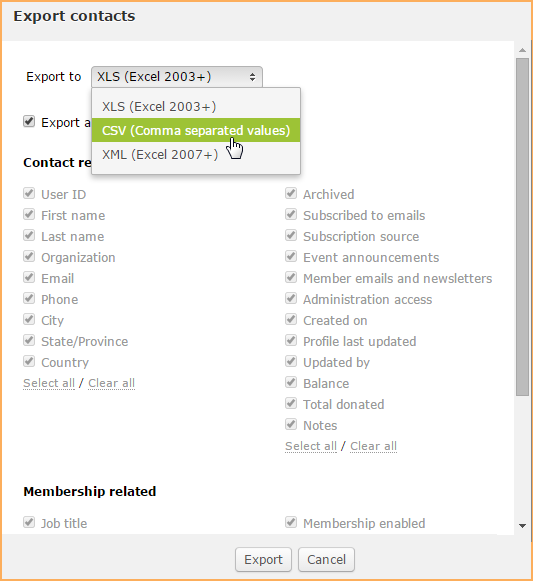 There are a number of reasons you might want to export data for members and other contacts. You can open the spreadsheet in Excel for further processing, analysis, formatting, or printing. You can use the export feature as a way of backing up your contact and membership data. The exported spreadsheet file can be imported back into Wild Apricot to restore contacts and their data. You can adjust data in the spreadsheet then import the modified spreadsheet as a way of making bulk updates to your contact database. You can export all your contact or membership data, or filter your contact or member list so you can export data for the selected members or contacts only. You can also use Wild Apricot's API to create your own custom programs that automatically retrieve contact data from your Wild Apricot account. If you want to export only selected contacts, filter the list. Choose your export file format. While the export file is being generated, you can click the Continue working button and safely switch to another Wild Apricot admin screen. Once the file is generated, you'll receive an email with a link to the file. 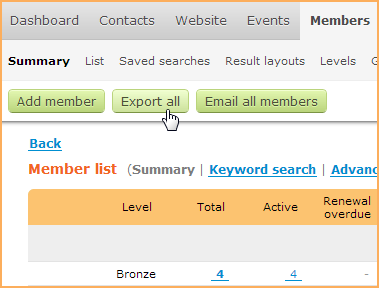 Hover over the Members menu and select the Summary option. If you want to export all members, click the Export all button. Otherwise, filter the list then click the Export button. Before clicking the download link within the email, make sure you are logged into your Wild Apricot account as an administrator. You can choose the columns to be exported as part of the export process. Also, the Password column will be exported if you select the Export all fields option. The exported Password column will always be empty, but can be used to import passwords. You cannot export picture fields or the photos displayed using them. Any date fields that you export will be formatted using the date format from your Organization details screen. If you have any trouble changing the date format in Excel, try exporting as an XML file. There is a scenario where malicious code could be executed when an exported CSV file is opened in Microsoft Excel. A visitor to your site enters executable code in a field on a public form, such as an event registration form or membership application form. The field is exported to a CSV field. The CSV file is opened in Microsoft Excel. The person opening the CSV file ignores the security warnings. To avoid this scenario, do not ignore security warnings when opening CSV files in Excel.